A woman at the gym today told me that the single item the homeless long for is a key. A door key to a room, an apartment, a house. A space to call their own. A place where they're welcome, where people know and care for them. 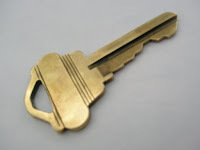 A single, metal key to a door to home. I had been telling her that last week, before she left for college thousands of miles from home, Andrea held tight to her house keys. We have a need for more house keys, and have been lazy about running to Home Depot to make copies. Independent of each other, Ron and I both asked her if she really needed her house keys between now and when she comes home for Christmas. In a firm tone she rarely uses, she told both of us that, thank you, but her house keys will remain with her while at college. Period. No exceptions. Now I understand. She wanted to keep with her front door keys to her own space, her own family, the place where she's understood and accepted and deeply loved. Keys to the place where she belongs. She wanted to know that she can come back home anytime. Which, of course, she can.